In 2016, union leaders admired Bernie Sanders’s long track record of fighting for the working class but considered him “unfeasible.” That’s no longer the case. 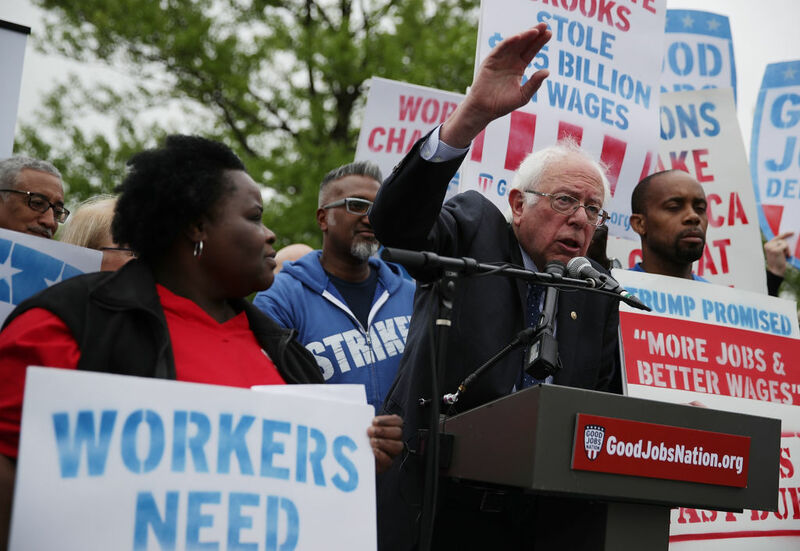 Organized labor must back Sanders’s 2020 campaign. Bernie Sanders is an anomaly in US politics. He has demonstrated a constancy of principles for more than forty years, guiding him to work in the interests of working people. Sanders hates personal political opportunism. He faced arrest as a young man, not for a photo op and name recognition, but because he hates injustice and believes in our society’s democratic ideals. Workers losing their homes, their families, their work, their self-esteem, and mistakenly labeling themselves as failures rather than victims of social, economic, and political forces allied against them — Sanders sees these as crimes against the spirit of humanity. That constancy of moral principles in favor of working people made Sanders the strongest candidate for organized labor in 2016. Yet nearly all the major unions endorsed and supported Hillary Clinton in the 2016 presidential campaign, even though her political record in support of labor was marginal at best. If organized labor had supported Bernie Sanders for president in the 2016 race, would he have won the presidency? For me, that answer is an unequivocal yes. That victory would have meant a massive shift in the political terrain not just of the United States but even the world. Labor would still be up against enormous odds. But we would have had the benefit of two years of heightened worker expectations and participation in communities around the country. And because participation is infectious, yet more activism would likely have followed, and the political terrain would have been favorable for scaling the once-unassailable wall of corporate power and its corporate legislators. All this would have had the support, leadership and institutional resources of the President of the United States. Sanders’s breadth and depth of understanding the realities that working people face is without peer in the US legislature. His struggles to help ordinary people are many and well-known: an unjust tax system, expansion of Social Security, free college tuition, Medicare for All, an infrastructure program that can create millions of jobs, a shift away from dependence on fossil fuels and towards sustainable energy, a trade program that recognizes and rewards the worth and value of labor, an end to Citizens United, greater support for the public sector, child care for working parents, pay equity, greater protections to form and join labor unions, workplace health and safety safeguards, affordable housing, elevating human rights as an inviolate element in trade policies, empowering worker, and an industrial regulatory regime that privileges worker skill enhancing over skill degrading technologies. He knows that a robust commons, the cultural and natural resources of a given society, is a necessity for social cohesion, necessary for a functioning democracy, and that it should and must be expanded and protected from privatization schemes. Sanders has consistently highlighted the improvement of the life chances of working people as his top priority and has often fought that fight alone rather than succumb to the corporate interests that dominate Congress. So with a very long record for working people, why didn’t Sanders receive the endorsement of the top leadership in most unions? It was not that labor’s top leaders were unaware of Sanders’s pro-worker agenda. And it was not that organized labor did not have heartfelt respect for Sanders. I witnessed that respect as a vice president of the AFL-CIO. When Sanders entered our Executive Council asking for our consideration of his endorsement, he was greeted with an overwhelming standing ovation. But the unquestioned loyalty to the Democratic Party’s anointed candidates is institutionalized for most unions. And a continuing Clinton dynasty was taken as an article of political faith by pundits nationwide, who called the race for her even before her official declaration as a candidate. Still, labor leaders knew the many betrayals from past endorsed Democrats and Clinton’s cavalier disinterest in most of labor’s issues. But those leaders were afraid of backing Sanders only to see Clinton win. They worried about the consequences of a President Clinton who did not forget that labor chose not to back her in the primary. The irony here of course is that Clinton’s political vision for working people was compromised by her extraordinarily comfortable relationship with Wall Street. Much of labor’s rank and file, on the other hand, viewed union endorsements of Clinton’s candidacy with little enthusiasm and much mistrust. In 2015, as a then-little-known Sanders toured the country, tens of thousands of workers listened. Despite their national unions’ endorsement for Clinton, union workers formed Labor for Bernie groups throughout the country. Many who were not familiar with Sanders previously now knew him as a politician who would stand with them on the picket lines. But that working-class excitement nationwide soon gave way to rage. Working people saw Democratic Party operatives rigging caucuses, watching the authentic pro-labor candidate be unfairly displaced by that party — a party that took huge amount in contributions funded by their own union dues dollars. Clinton would not even agree to the demands for Fight for $15, perhaps the hallmark campaign of the labor movement in a decade, let alone Medicare for All. Yet those same workers were expected to show up and to work for that candidate, who was clearly not “one of them” and oblivious to their life circumstances, to defeat the Republican who was deemed far less viable than even Sanders. Donald Trump’s campaign seized upon the populist message of Sanders. Even though he was a member of the wealthy elite, he cynically appropriated Bernie’s message and ran on a message of both betraying that elite and arguing that the Democrats had betrayed workers. Many — though not all — in the Democratic Party no longer describe Sanders’s main message of economic and social equality as “unfeasible.” They acknowledge the widespread demand for that message. Yet the discussions among many top US labor leaders mimic the Democratic Party mainstream and center on Sanders being too radical for the “average” voter. Today’s labor movement stands on a razor’s edge between becoming a progressive, reinvigorated champion for and of working people, or an historical footnote in modern capitalism’s mindlessly amoral quest to amass more and more wealth in fewer and fewer hands. The Janus decision severely challenges the dues base and thus the public voice of the public sector workers, whose unions are among the most activist in the labor movement. Unions need to radically change course to survive, to say nothing of thrive. Yet Democratic Party presidential candidates and Democratic Party operatives are again courting top labor leaders with faux promises of jobs, better relationships in the White House, and the derived — and contrived — status that accompanies it. The bar is so low that even Beto O’Rourke, a potential candidate who opposed collective bargaining for public sector workers, is wooing labor leaders from his dentist’s chair while others detail the benefits of more prisons over and against a better funded and expanded educational system. Labor institutions have the power to join with the populist Sanders movement and make his nomination within the Democratic Party a reality. But will they stand with the candidate who has stood with them for decades? Or will their fear of endorsing a candidate deemed “too radical” by the political establishment envelop them in a paralytic political psychosis? Will they tell themselves that passing on the best chance in their lifetimes to bend and reshape the arc of history to elevate the life chances for hundreds of millions of Americans is too much of a risk to attempt? Will they fail to note the irony of their fears, admitting to themselves that fundamental to every union organizing campaign is the brutal truth that workers who organize with their coworkers are asked to take risks to build a better life for themselves, their communities, and their families? Will they camouflage their fears as political acumen by accommodating the trope of the moment that any Democrat can beat Trump and that is all that truly matters? If labor continues with business as usual, fundamental change will never happen. That change can only be achieved with a clean political and ideological break with the pro-corporate Democratic Party orthodoxy. Central to that break is a coming together of labor institutions with the mass movement aligned with Sanders’s vision. Only that kind of organizing within labor can overcome the corporate oligarchy plaguing the Democratic Party and break the party’s ability to dictate electoral endorsements to organized labor. A Sanders campaign will be about resuscitating the hope of the American people, speaking to the best of the idea of the American dream. It is a chance for us to reclaim national ideals lost. And it demands that we be authors of our own destiny, to transform our country. By fighting for Bernie, the American labor movement can play a decisive role in this transformation. History is calling. Will unions answer? RoseAnn DeMoro is the former executive director of National Nurses United and of the California Nurses Association/National Nurses Organizing Committee.